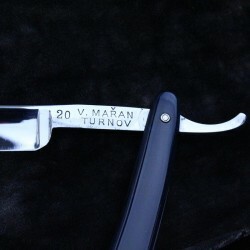 This 4/8 straight razor appears to have been made for a Czech retailer V. Maran, by the Sheffield company Keyser Ellison, who were steel manufacturers in Carlisle Street, East Sheffield in the late 19th Century. 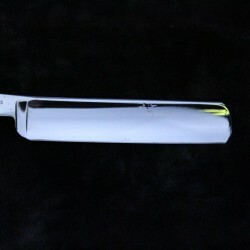 The razor is a full hollow and is made of silver steel. One side of the tang is marked V. Maran Turnov (a town in the Czech Republic), while the other side bears the legend "Made from Kayser Ellison & Co's Best Sheffield Silver Steel". This 4/8 straight razor appears to have been made for a Czech retailer V. Maran, by the Sheffield company Kayser Ellison, who were steel manufacturers in Carlisle Street East Sheffield in the late 19th Century. 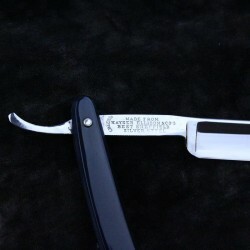 The razor is a full hollow and is made of silver steel. One side of the tang is marked V. Maran Turnov (a town in the Czech Republic), while the other side bears the legend, "made from Kayser Ellison & Co's Best Sheffield Silver Steel". 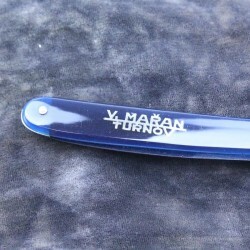 The scales are made of plastic/composite in an unusual deep midnight and are inlaid with the with the words "V. Maran Turnov". 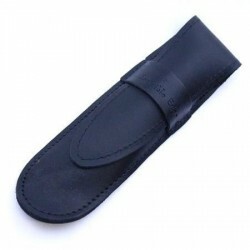 The blade would have originally had a satin finish. There is pitting in several places from historical corrosion, as shown in the images. This includes an area near the edge of the blade, but honing has produced clean metal along the length of the entire edge. 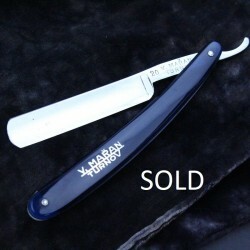 Nevertheless, the price reflects its condition, and as such this represents a good value way to experience a straight razor shave. SHAVE READY - Unlike some retailers, we individually prepare all the razors we sell. For full details see our policy.